Hawaiian floral serenity welcomes you to this gorgeous ocean front house. Take comfort in the open space while accommodated by the vast view of the Pacific Ocean. The ideal romantic retreat for families, friends, newly weds, as well as group gatherings. The only way to stay closer to the ocean would to be in a boat. Sit back and watch the cruise ships slowly pass by knowing that the passengers aboard are truly envying your luxurious accommodations. This elegant and spacious home offers a nearly 180 degree view of the Pacific! Walk through the front door into a vaulted great room with expansive windows looking out to the ocean and all that it has to offer. Hardwood floors, granite kitchen counters, two separate bedroom/bath suites each with its own deck from which to enjoy the cool breezes from the ocean. The spacious oceanfront deck of the house also has an outdoor sink/bar for outdoor entertaining. The home is furnished with high quality furniture that has been handcrafted using several different types of Hawaiian hardwood, lots of beautiful artwork and comfortable furniture. 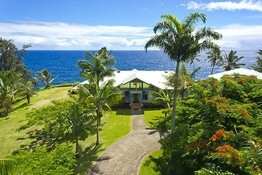 The main house features two spacious bedrooms each boasting its own private bath and private lanai. There is also a fabulous, outdoor shower just off of the Hamakua bedroom. The main house allows for comfortable accommodations for four persons. The separate 2 bedroom/1 bath guest ohana, which sits above the garage, is also well furnished and has its own private and spacious lanai. The guest house also comes with its own full kitchen, washer/dryer and of course, breathtaking views.